A shortish walk around Lough Bray Lower, with great views over secluded Lough Bray lodge. A longer walk around both Lough Bray Upper and Lough Bray Lower is also possible, but I prefer the shorter walk myself. 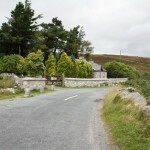 The route starts at the path beside the gatehouse to Lough Bray lodge. There is a layby a hundred metres or so further along the road where its possible to park, although it can get tricky to find space in summer. Follow the path away from the road and you will soon see Lough Bray Lower. Follow the path around to the left and around the lough where it then climbs steeply up to Eagle Crag. There are excellent views over both loughs, and of Lough Bray lodge. 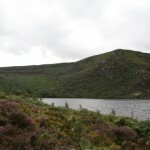 From Eagle Crag, bear right and follow the path along the ridge around Lough Bray Lower. This returns to the road to the north of the gatehouse, from where it is a short walk back to the start of the route. Just stumbled upon your site. Great idea and a very fair comment about the lack of such a site on web etc. One small suggest is to put road numbers onto all routes. E.g. lough Bray is on the R115. 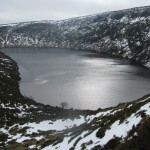 Anyway thanks for your site and I hope to persuade my family to do the lough bray walk tomorrow.!! I was hoping the google maps would take care of that, but point taken. I’ll add some more road details. Love this site, great idea thank you! Would love to see printed which walks could be done with a pram.. We’re up for doing all walks 2-3 hours +. Hmm, I’m not sure any of the walks here area really feasible with a pram. I do have a couple of new walks which I would say would be ok with a pram – one in Cruagh Wood and the other at the Lead Chimney near the Scalp – but I haven’t had time to add them online just yet. Will try to get them posted up asap. 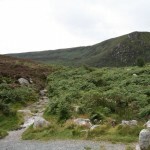 The lough dan walk could be done with a pram if you stick to the road and path. You may need a little help getting over the stile, but i am sure it can be done. Be prepared for hard push up hill! Well done with your site. 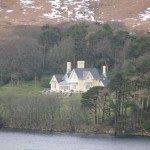 I climbed up Eagles Nest above Lough Bray and back to Gate lodge with 5 kids – youngest being 3 years old in approx 2 hrs. Myself and few friends have started doing 20km walks along Wicklow Way. Do you know of a route around the Lough Bray Upper and lower which would take approx 3.5 – 4 hrs? We want to avoid having to walk on the roads? Done this walk today after reading about it on your site. Absolutely fantastic.Really enjoyed it.A bit slippy and wet but well worth it. Thanks a million! Great site. Agree with some other commentators that a “pram friendly” and “bike friendly” filter on routes would be really helpful. Also some road references to get there. keep up the good work!. L.
did a nice walk last Saturday, 21/05/11. Started in Crone car park. Up WW as far as Glenspolan edge, then up to Maulin summit. From there across to Tonduff South and then Tonduff North. Descended from Summit cairn down to Military Road. Intended to do a circuit of the two Lough’s Bray. However could not see any kind of track or path coming down, (or going up!!) for Upp Lough Bray. Did wonder if it would be possible to take the Kippure Road up for a few hundred feet, and then switch over towards Upr Lough Bray? I needed to do it from that side, as it would then be simple to road walk back down along Glencree Valley to Crone car park. I did this walk this morning, and it was lovely with the lakes and mountain. My only rant is I forgot about our Irish weather condition that made the entire path a swamp. You had to go very slowly and watch every step and even still I fell over several times sliding in the muck. Just back from this walk. Did the loop all around lower lake with 3 kids (youngest 3 and oldest 6) and took 3 1/2 hours but stopped 3 times for breaks/lunch etc. Very mucky (husband scrubbing shoes in sink right now!!) and quite hard to find path after leaving Eagle Crag, and it seemed to us like you just had to go across country for a bit which was hard going but maybe we missed something? The whole thing was a great adventure for the kids, the views were stunning and the weather was amazing for an early November day. I have done this walk twice now and it is great – thanks for the route! It was muck today so you defo need a good pair of boots The views from the Eagles Cragg are fantastic. I always lose the path on the way back (from approx behind the main house) – although maybe there is no path and you just head for the road? Can I bring the dog to this walk? I know he is not allowed into Lough Dan! Welldone on your fantastic website. Did this walk today and it took me just over 2.5 hours including a 20min stop on Eagle Crag which was beautiful and stopping for great photo’s along the way. Let me say firstly that I am a 60year old with more determination than fitness and carrying excess baggage. This walk is not like a lot of the wicklow way sections as the trail is extreamely mucky and difficult underfoot. I did slip a few times despite taking care. The trail is very difficult to find in parts especially on way down from Eagle Crag and I ended up coming out much further up the road than I needed to be. I would recommend very good walking boots and think walking poles would be useful on this walk. this is a great walk and the scenery is fantastic. thanks for the info! however i agree with Karl, its not easy to find the path at times and good walking gear is needed. it can be very mucky and steep. its well worth doing it though!! Thanks for the walk, completed in 150 mins. First section was very overgrown with high ferns and heather. Quite hard to find path, however after at least 30 minutes I found a trek. The climb up to eagles crag is quite steep and not for the faint hearted. Wild mountain goats and sheep are to be seen, first part of walk from eagles crag very enjoyable. I seemed to have veered off too far too the left and joined the road 2 km from the layby after a final section of ferns etc. I would recommend strong boots and a good walking stick or poles. I was lucky because of 3 dry days in advance, however still soft in spots. I walked Lough Bray Lower last weekend, found it enjoyable and challenging. I think it is suitable for dogs, but you wouldn’t get a buggy around the walk. The ground was very wet and mucky so there was the odd slip along the way, but if you don’t mind getting dirty, this walk can become a good adventure. The climb to the top of Eagle Crag is steep, but the views and scenery up there make the climb worthwhile. The track can be hard to make out at times, but if you keep the lake to your right hand side at all times then you will come full circle around the lake and back to the start of the walk. My dog was well able for this walk and even the climb to the top of Eagle Crag. Great site by the way, I plan to do a few more of your suggested walks! Did this today in fairly bad weather. The previous posters who’ve taken small kids on the full route must be mad – there’s far safer walks available, including several marked on this site. While you could probably take the route anti-clockwise with small children as far as the Eagle’s Crag, taking them clockwise up the Eagle’s Crag is a bad idea. The area’s very boggy, and holds water for a long time after it rains. I reckon I busted a rib slipping off it it this morning. Anyway, if you’re taking kids out for a long walk, I’d suggest somewhere like the Devil’s Glen, one of the lower walks around Glendalough, or around Lough Dan. Just did this walk. Loved it. I have just started hill walking. At first I thought I wouldn’t make it, but I did. Love the website. Will do more walks from the website. Would have loved to know how many km I did and the climb. Hi! I did the walk today with 3 more friends (all in their 30ies). It took about 2.5-3hrs and it was fantastic! It was not busy (e.g. like Glendalough where buses drop dozens of people): we almost had the trail alone for us. I would recommend waterproof hiking shoes as it can get plashy which makes the trail exciting and gives you a sense of achievement!. Views and scenery are second to none! Thank you guys, this is an excellent blog and inspires my wife and me what to do during weekends! A great walk today up to eagle crag, We were very lucky with the weather, We started the walk from the gatehouse sticking to the directions you provided. The trail was very mucky i would definitely advise wearing gaiters, the ascent to the eagles crag was steep enough and involved abit of a scramble but the views were worth it, the only thing is on the way back from the top of Eagle Crag, as you bear right and follow the path along the ridge around Lough Bray Lower the trail forked just as you follow the trail behind lough bray lodge along the ridge, we took the left trail which was the wrong path which took us away from the road we should have taken the right trail to lead us back to the road north of the gatehouse. A very beautiful walk! The views, the silence, a challenge – all the ingredients were there. You shouldn’t be afraid of water and mud though. We were very happy to have our good walking shoes – the path was extremely slippery. Directions were easy except for the final part, where we found no path and went across the meadow – and so did another group of hikers we saw. Even on a November Saturday it was difficult to park – there is very little place on the side of the road, and the walk is becoming popular with hikers. Saw this walk in the “Irish Times” and here. we did it last saturday in January. Its a lovely walk, parked in glencree and walked the road to the start at the gate house, lovely sight of the lower lake within minutes, then took left to skirt around the upper lake and back to the road at a lay-by. turn right at road and after 50 metres take track to right up to Eagle Crag and round both lakes. At the back of the lodge we followed the well trodden track through open country to the road junction leading to Glencree. The walk was “soft” in places but mostly spectacular. Just over 3 hours walking. Is it possible to get there by public transport from dublin? Paul, don’t think you’ll get to many of these walks by public transport…maybe the more touristy places like Glendalough. This walk is great…amazing views from the Eagle Crag. However, its bogland so it gets very muddy and slippery when it rains and there is quite a steep incline to the crag…just something to be aware of. Like some of the commenters above, I had difficulty finding any sort of a path on the back end of the loop, so ended up quite a distance up the road from the starting point. Admin, I hope you’re keeping this up-to-date…it’s an amazing website. There’s nothing like it out there! I am wondering if Dog’s are allowed. We keep ours on lead for countryside walks so no chance of her chasing the sheep but I know some farmers don’t want any on the land. Cheers! I’m asking the same question as Charlie, “Are dogs allowed?”. In England it is normal to bring a dog on walks – on a lead of course, especially around livestock.